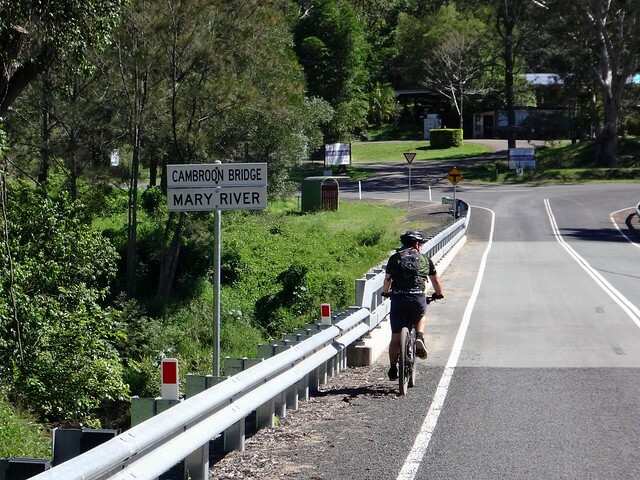 Yesterday I rode from home up the range to Maleny. I spent a luxurious night at local hotel, Maleny Lodge, and had a huge cooked breakfast which I couldn’t completely finish. 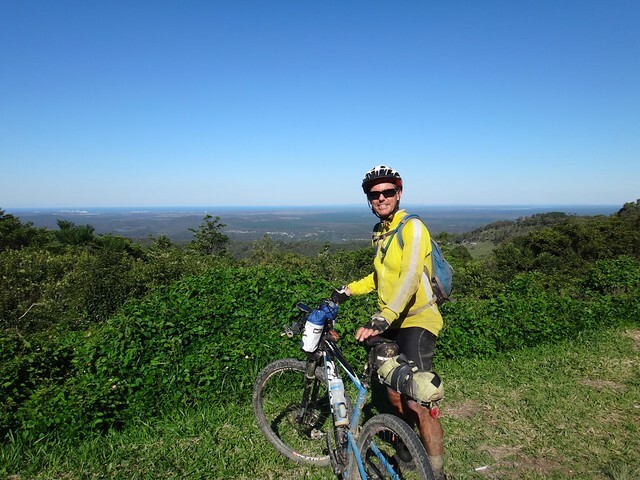 Technically speaking, this isn’t really “bike packing” – I didn’t carry any camping gear on the bike and I slept in five-star accommodation. But it did give me the big adventage of being able to travel lightly. I think this is the best way to travel. Megan, the hotel manager, even washed and dried my cycling clothes, carefully folding them and laying them out for me in the morning. I think I could get used to this level of comfort! 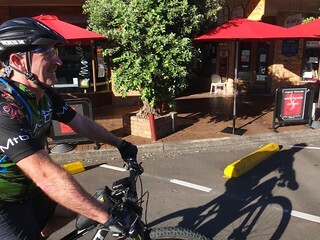 Darb found me, and we pedalled out of town past the numerous delightul cafes and boutiques of Maleny. 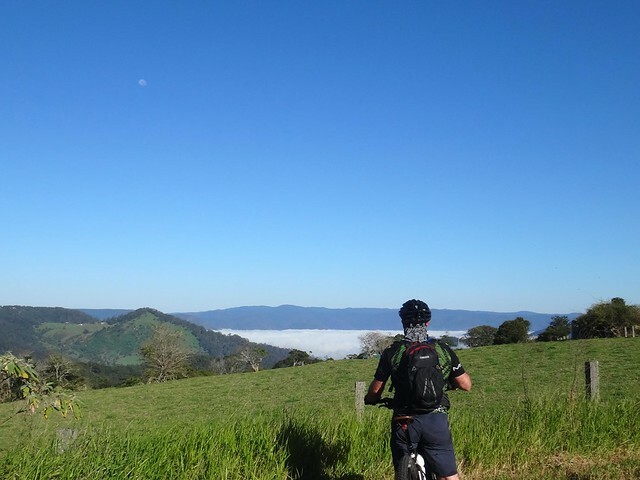 We followed the paved road out of town, stopping to enjoy the views of the fog in the Mary Valley below us. 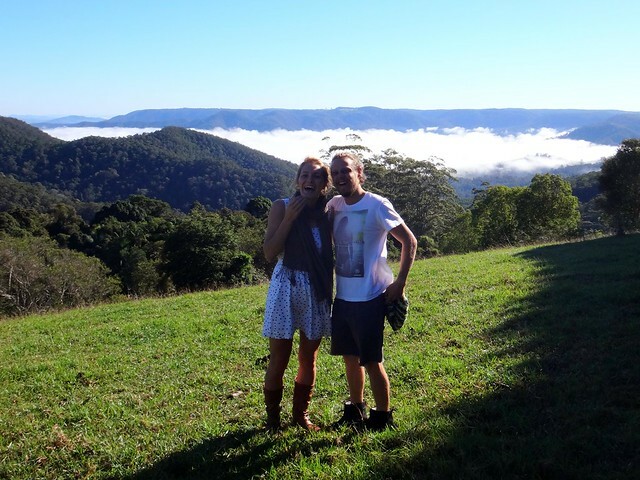 After a short detour to Obi Lookout we met Rachel and Ben who were just as impressed with the view as we were. 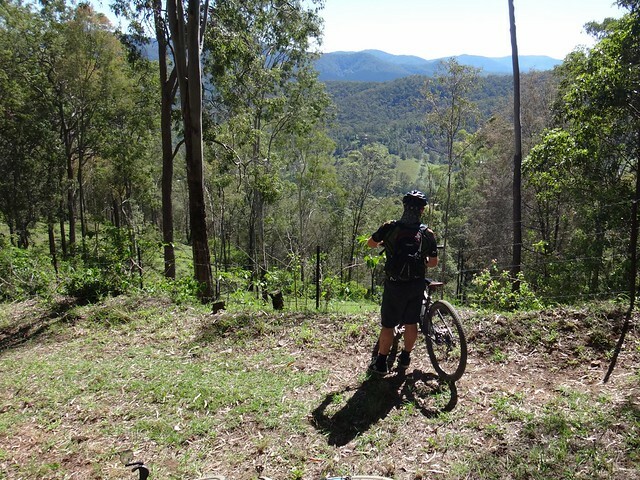 As we climbed slowly towards the forest at Curramore, the views grew more stunning. 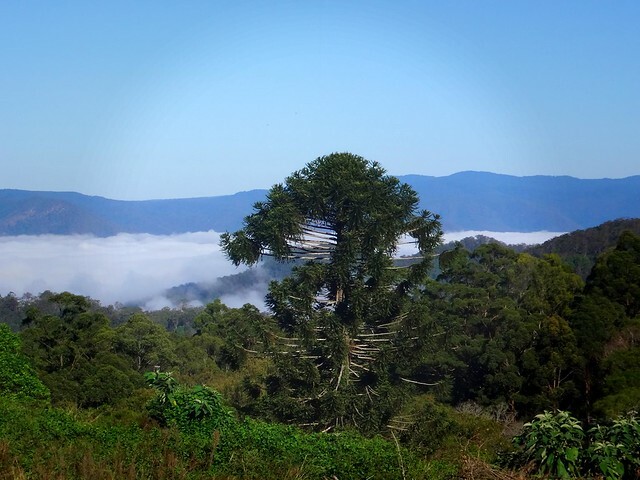 Bunya trees reached majestically out of the hillsides towards the heavens. 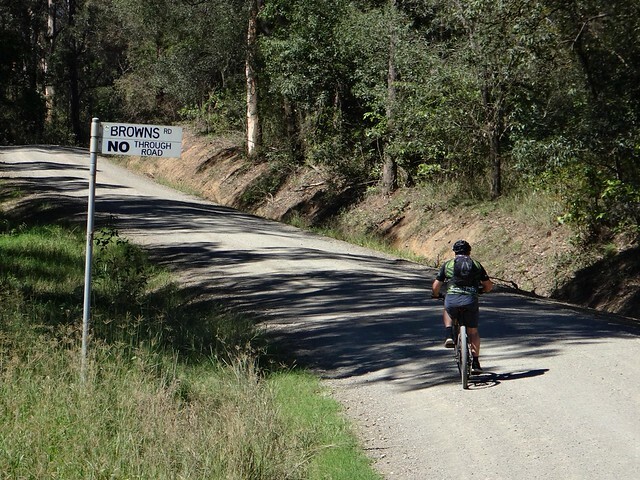 Eventually we reached the end of the bitumen, glad to hear the friendly crunch of tyres on gravel. 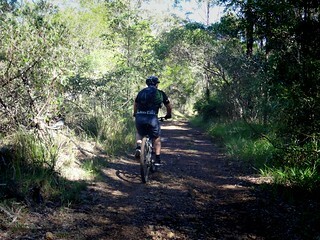 The trail undulated through the rainforest and over creek beds, then slowly started to climb again. 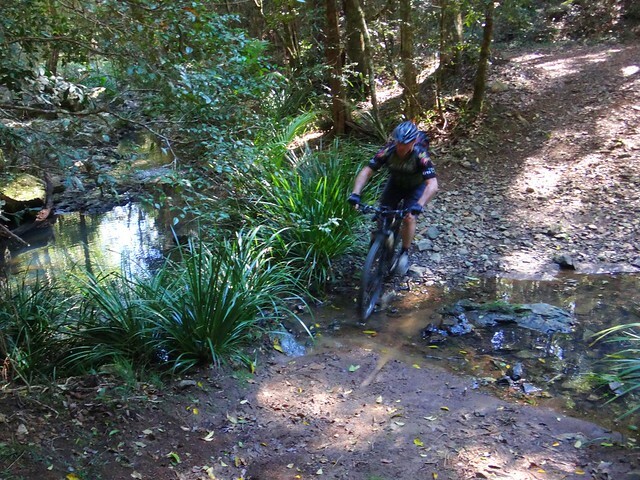 We crossed numerous puddles, and as often happens, I slipped and fell in one. It was a whole-hearted splash. I ended up on my back in the muddy water, almost completely covered. So we had to stop for a while to let me clean up a bit, and to allow Darb to capture the moment for posterity. I’m surprised how well my clothes shed the water and mud afterwards. 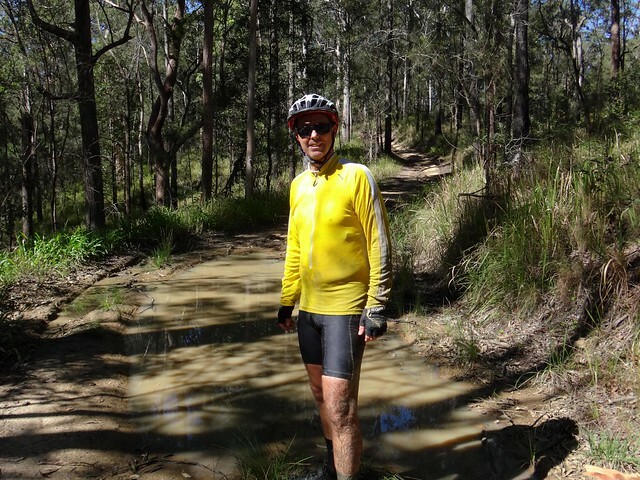 Within half an hour I was quite dry – just a little bit dirtier than usual. 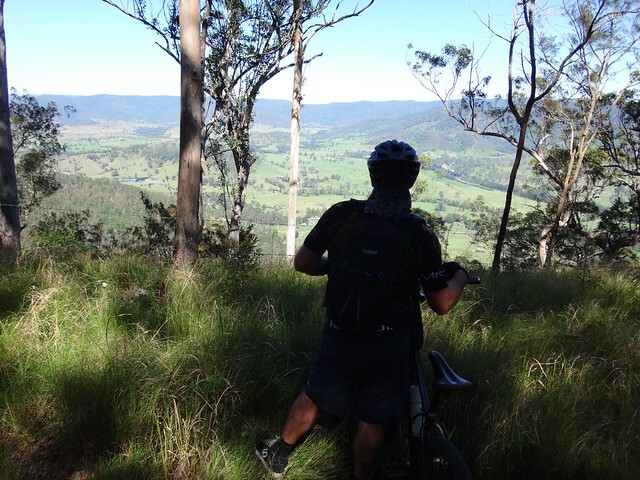 We enjoed the westward views down to the Mary River below us. Ah “Hike-a-bike”. No ride would be complete without one unrideable section to push the bike up. Eventually the gradient did drop – like a stone. 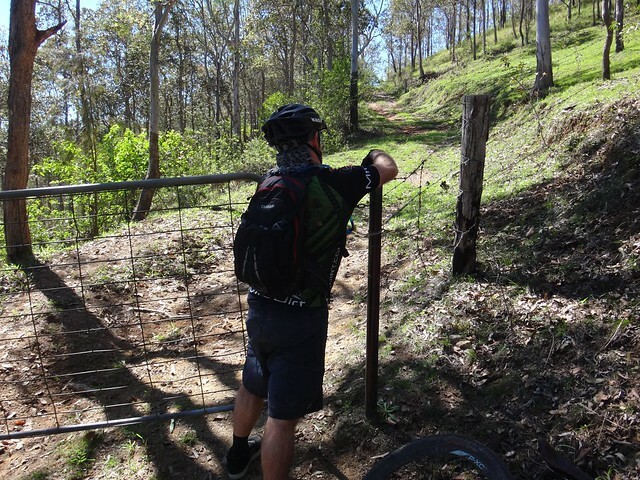 We skidded down the impossibly steep descent, stopping several times to open gates on the way down. And so we reached the Mary River. What had been a twinkling slither of blue in a distant valley was now flowing right under our feet. We’d reached half-way and felt like having something to eat in nearby Kenilworth. Unbeknownst to us, Kenilworth was very busy. 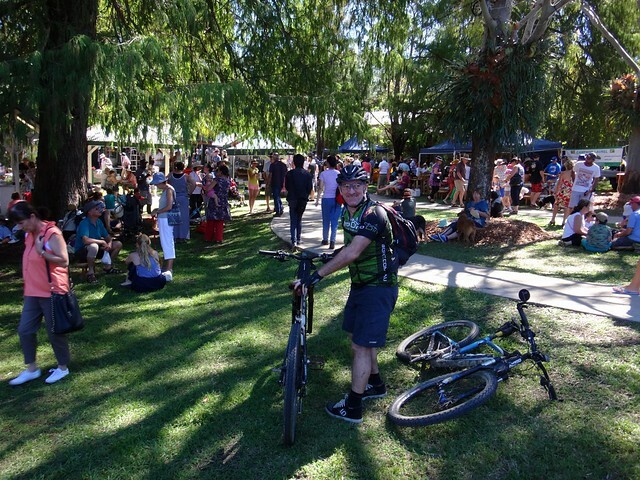 They had a local food festival, and the town was crowded with holiday makers. It was going to take ages to wait for any food orders, so we just ordered the simplest thing we could find, and grabbed a vacant patch of grass to eat and rest. 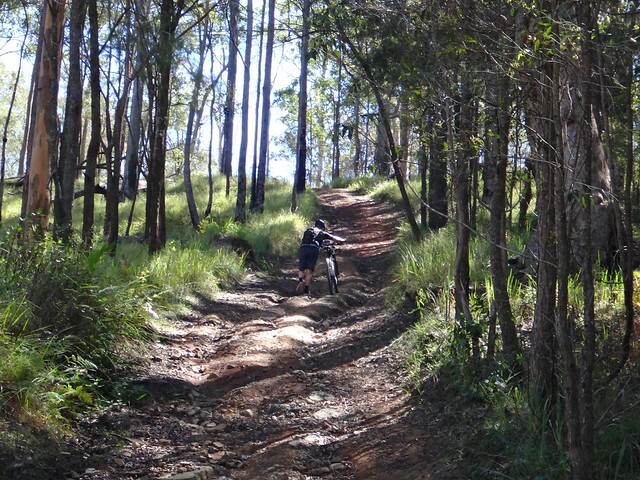 As with any ride that starts and finishes on top of a mountain, we had a long climb back up to the top. 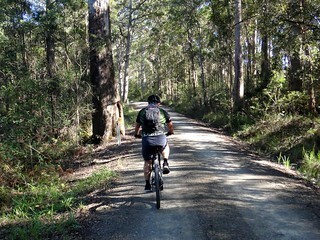 Kidaman Creek Road rose sharply as we made our way back up to Curramore, climbing almost 500m in about 10km. Darb led for most of the way, and graciously waited for me at various points to allow me to catch up. We were both relieved to reach the top. That was one hell of a climb. By comparison my sojourn up McCarthys Shute the day before seemed much easier. 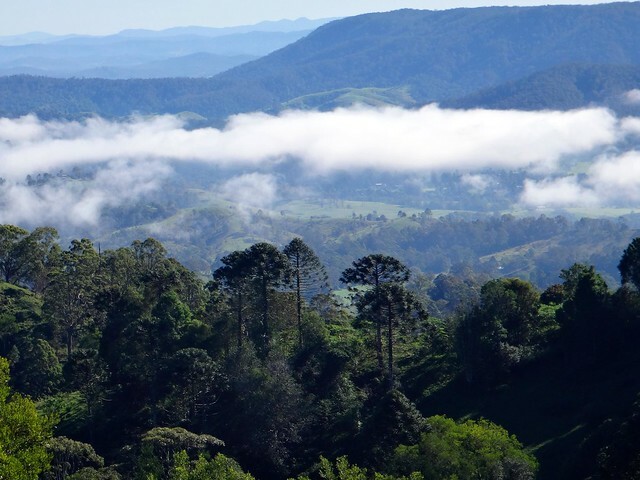 The midday sun had burned away the fog from the valley below as we retraced our steps back to Maleny. 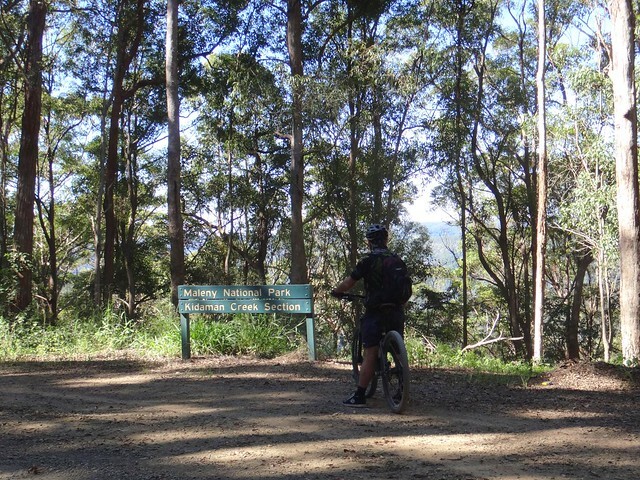 We arrived earlier than I had expected, so I refused Darb’s generous offer to drive me to the railway station at Landsborough, and decided to ride down the hill on the main road instead. What an intense experience! 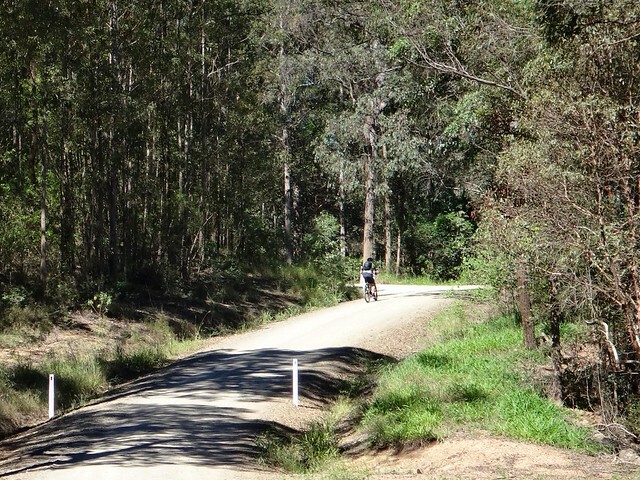 The road to Maleny is busy, and has descending gradients in excess of 12%. I pointed the bike down the hill, let go of the brakes, tucked in, and held on for dear life. 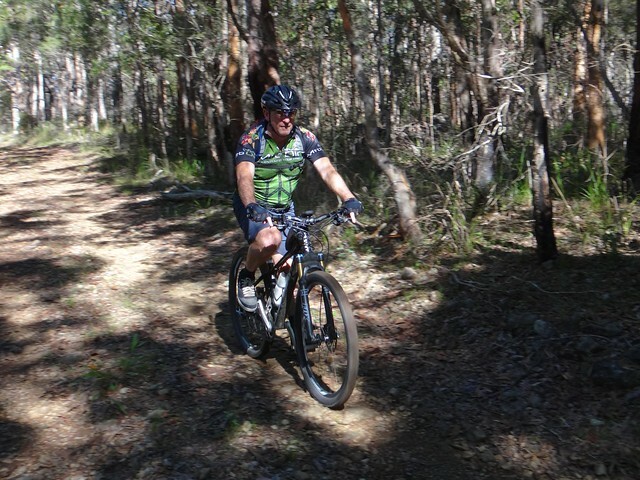 My tyres howled loudly as I kept up the same speed as the rest of the downhill traffic – about 75 km/h for about 5km. I’ve ridden faster, but never for such an extended period of time. 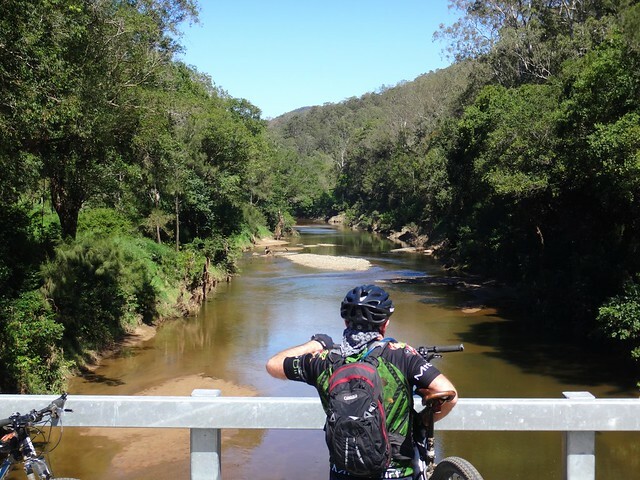 After almost 88km and over 7 hours of riding (including stops), I finally rolled into Landsborough with lots of spare time to catch the train. I had burned about 3,000 kcal and climbed just under 2,000m in vertical ascent. I’d rate this ride 9 out of 10 on the tough-o-meter. Thanks Darb for a great day. 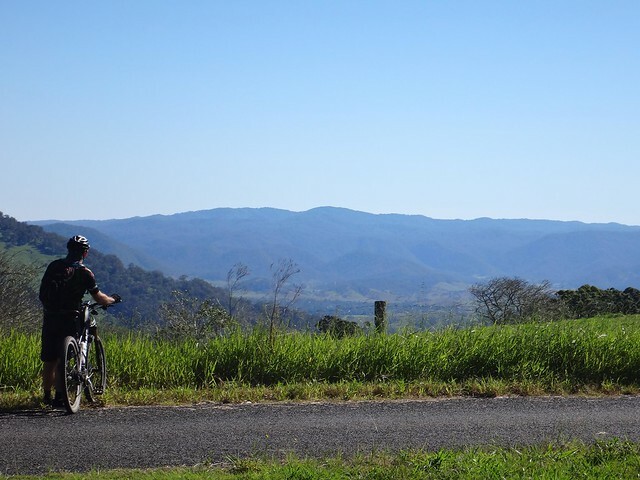 Maleny Kenilworth 2014-04-19 from Darb Ryan on Vimeo.